My plan was to have a menu based on the 3 countries represented around the table: Portugal, Italy and Malta. Which included, of course, the desserts. On Christmas Eve, my aunt was in charge of dessert, and the plan was to make rice pudding Portuguese style 🙂 But for some reason she gave up on that and decided to make a caramel custard pudim flan which is also very popular on our tables back home (I’ll show you the recipe, don’t worry!). For Christmas Day lunch it was my turn and I decided to go Italian and make vanilla panna cotta with Summer berries coulis. What about Malta, you may ask? We also had a “cake table” and there we had “Bolo Rei” from Portugal (a round cake with a hole and raisins, dried fruits and crystallized fruits), Italy was represented by a Panettone and I made my own Maltese Puddina 🙂 Apologies if it’s not very traditional, but this was the only sweet I found in Malta that is totally different from what we have back home. I will show you my recipe later so you can tell me how good (or bad) I did! In a small bowl, sprinkle the gelatin over the milk. Let it stand until the gelatin is softened (about 5 min). In a large saucepan, combine heavy cream and sugar. Add the vanilla extract. Bring the cream just to a simmer (do not let it boil), whisking occasionally until the sugar has completely dissolved. Remove from the heat. Add the gelatin mixture and whisk to completely dissolve the gelatin. Strain the hot cream mixture into a large glass measuring cup with a pouring spout. Pour into glasses or small pots. Refrigerate for at least 3 hrs or overnight. In a small saucepan, add the berries cut into small pieces. In my case, I just used the berries from frozen. Add the sugar and a small amount of water. Mix together and let it come to a boil over low heat. Stir constantly to help release the juice of the berries and dissolve the sugar. 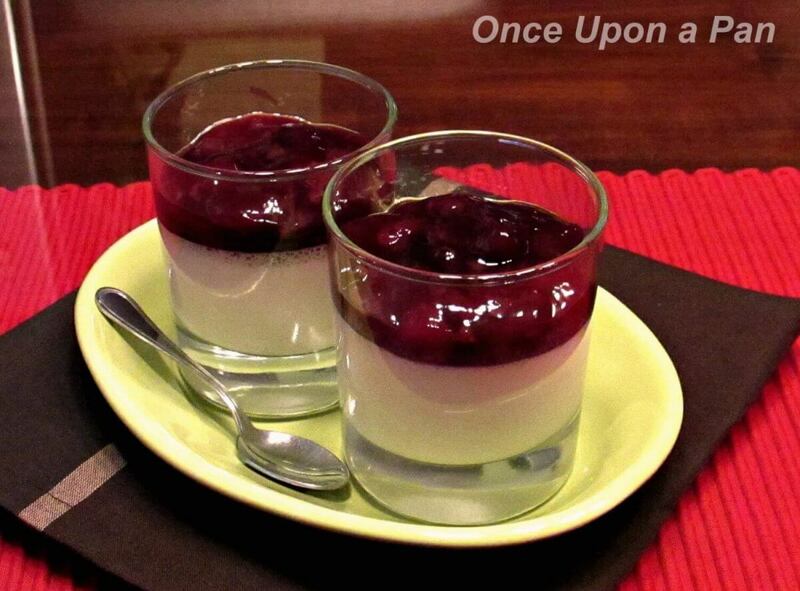 Remove the panna cotta from the fridge and place a small amount of coulis on top of each glass. Don't skip the straining step as it removes any bits of in-dissolved gelatin and insures a nice smooth dessert. Also, don't let the cream mixture cool before straining. If you decide to unmold, carefully dip briefly the bottom of each glass in a baking pan of hot water. Run a thin knife around the each of each glass to loosen it. Invert the glass onto the serving plate and carefully lift the glass. Top it with the coulis. The coulis will keep in the fridge for a few days.